Ubisoft’s city building franchise is about to expand again, with Anno 1800 set for a late February release. In the meantime, though, you still have time to sign up for (and hopefully play in) a closed beta, which starts January 31. The closed beta trailer, which you can view below, provides a succinct run-down of the latest Anno game’s setting and features. You’re in charge of Victorian-era city on an island, and your job is to guide its growth through the Industrial Revolution by building farms and factories, and by keeping your population of farmers, workers, and upper-crust elites happy. Julian took Anno 1800 for a spin last week, and ran into some economic problems that mostly had to do with red pepper farming. Several ill-advised decisions about red peppers and how to acquire them eventually led to riots in the streets, but Julian says he’s ready to start a new campaign. Farming and production aren’t the only things with which to concern yourself in Anno 1800. At Gamescom last year, Ubisoft highlighted a new feature the game is bringing to the series: expeditions. These will be to seek out ancient artefacts and exotic animals to display in your city and help raise its attractiveness, but while you’re out exploring, you’ll run into little ‘choose your own adventure‘ encounters on the islands you visit. Naval bombardment and coastal artillery will also have to figure into your plans, as the video demonstrates. To sign up for the closed beta, head to the Anno site and register with your Uplay account. You’ll get instructions on what to do next via email. 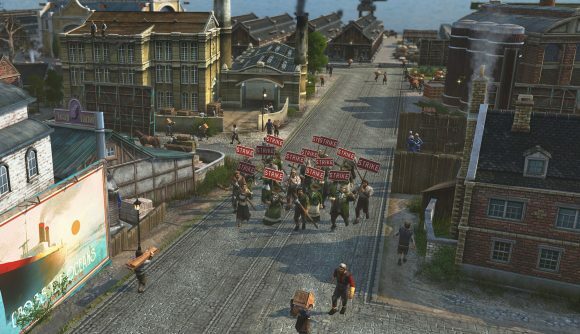 Anno 1800’s focus on 19th century economic issues like the dynamic between workers and farmers, and its distinctively Victorian look, have got us looking forward to diving in. The closed beta will be a nice preview of what it has in store when it launches February 26. Just, be careful with your peppers.